In 2008, I accidentally started a business that spanned a decade. 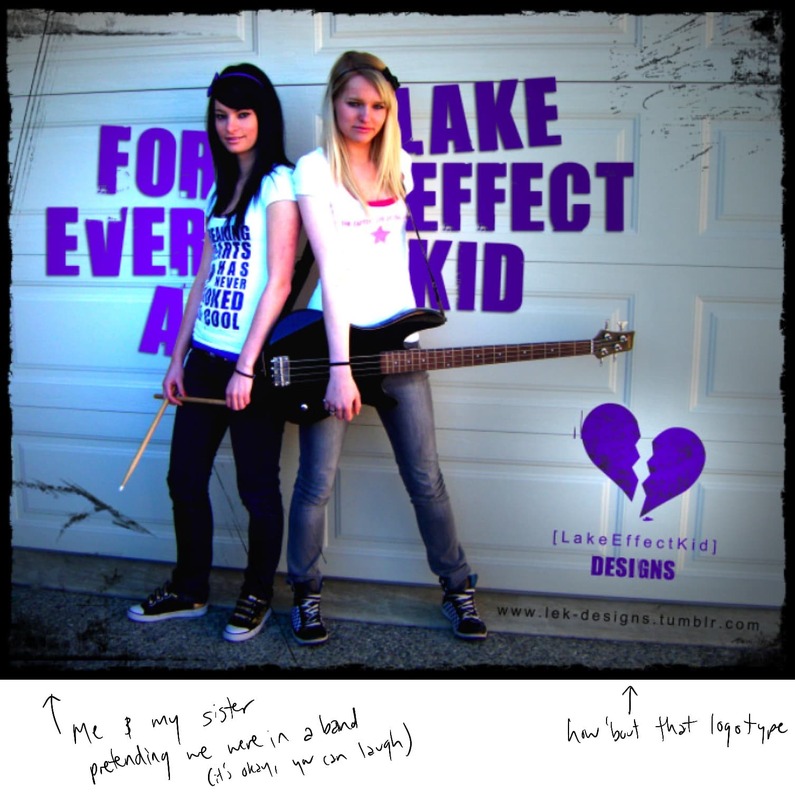 I want to tell you the story of this business and how being a fan-girl of a pop-punk band enabled my first ever side project. I was a design student in Wellington discovering the true joy of the internet: connecting with strangers over mutual interests that none of the people in your real life seem to share. Fall Out Boy were releasing a new album, and they were dropping clues about the release date and the title all over the internet. 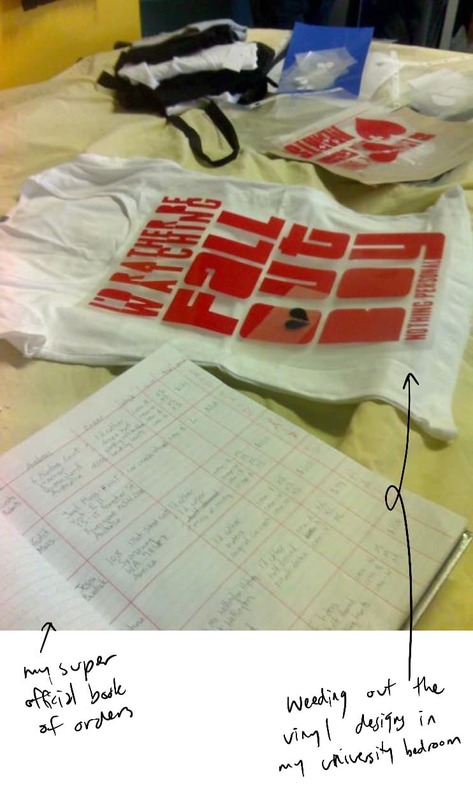 I was keeping up with it all through a Tumblr blog someone had started to repost all of the clues. I spent hours every day trying to decipher the puzzles with my newly discovered internet friends and made a Tumblr blog myself to post my thoughts. Eventually, the mystery was figured out. The album was released. But the community aspect of my little corner of Tumblr stuck around. I’d built a small following of people who loved music as much as me, and I found some confidence to share a lyric design I’d made and printed on a T-shirt. I can’t remember who said it first, but in 2009 I started getting comments like that. And it made me dare to dream. Could I print and sell t-shirts? Is that something I’d be able to do? At that time in New Zealand, as a music fan it was incredibly difficult to get your hands on band merch. 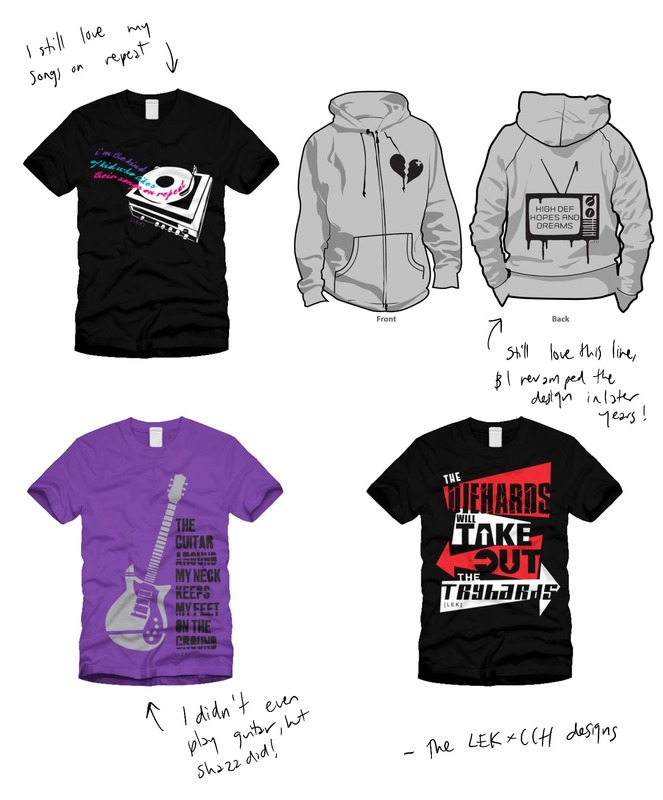 And even if you could afford the stupidly-high shipping rates from the US, merch designs were kind of crappy anyway. 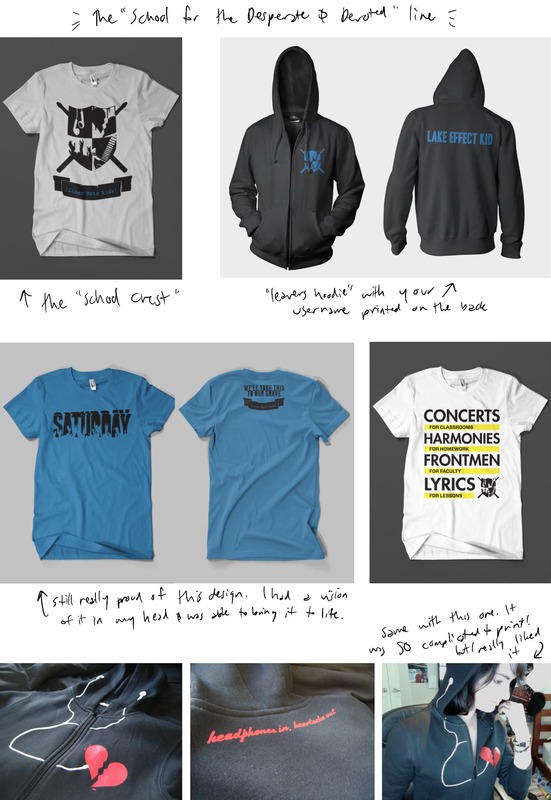 Thankfully now we have people like my friend Brent Galloway designing amazing merch for bands, but back then it felt like the bands I liked weren’t offering the kind of designs I’d want to wear. Of course, there are many reasons why. 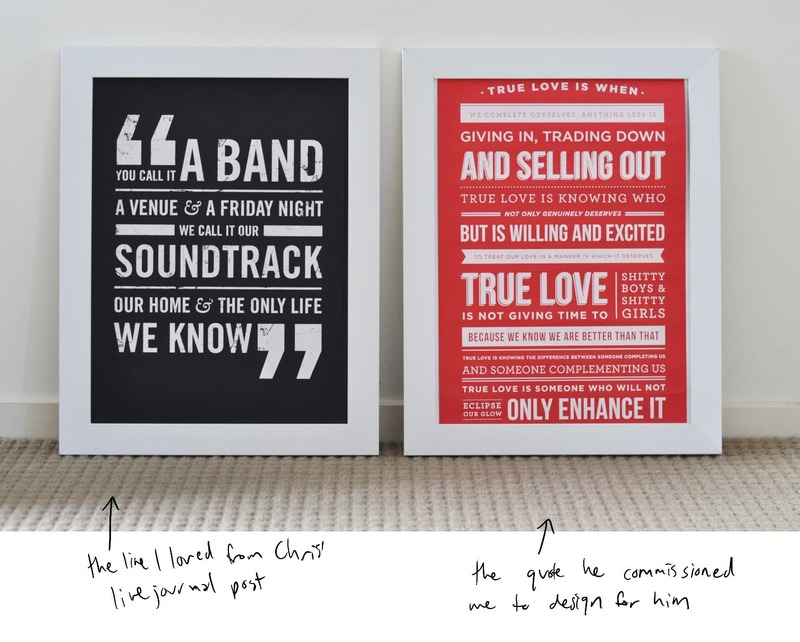 Using lyrics in designs is a legal grey-area for one... but I didn’t really think about that. 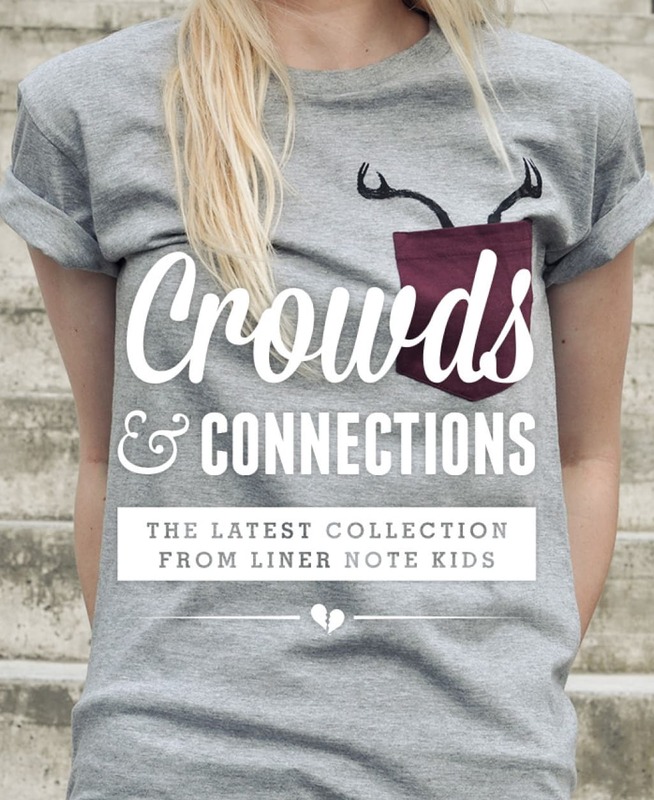 I wanted to wear shirts that professed my love for bands, and I knew other people did too. Let’s make it happen. I had a way to print shirts. I had designs. 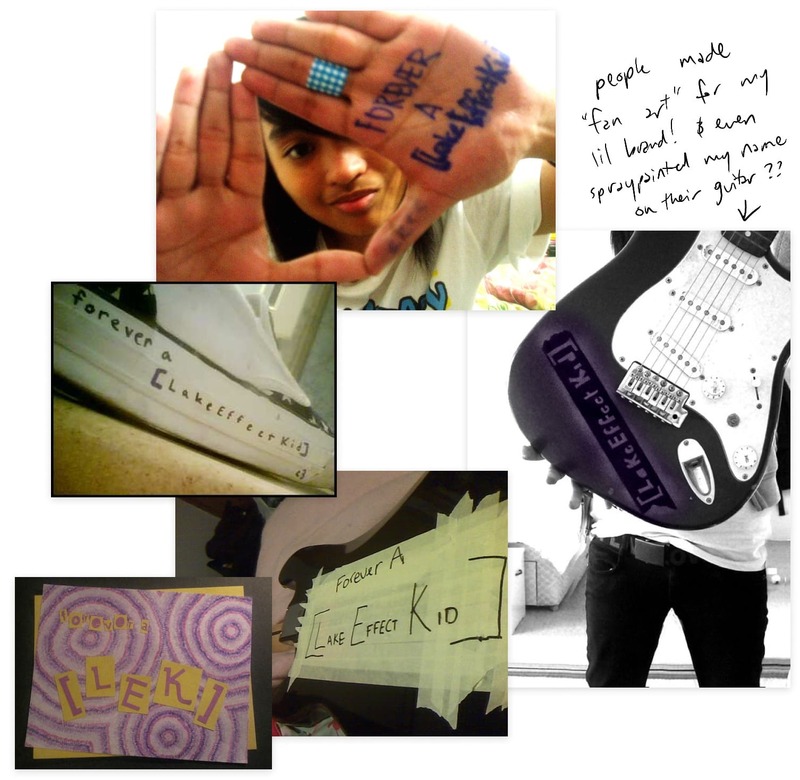 I had a (pretty crappy) brand logo and some hilariously emo promo imagery. And I had people who wanted to wear my designs. I made sales through Tumblr. No ecommerce store. No email list. 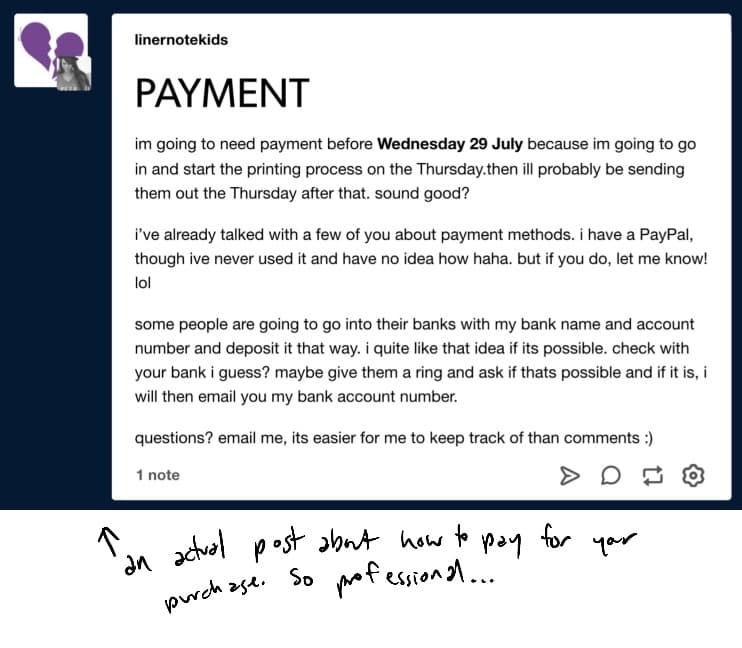 Just posts like these informing incredibly trusting strangers about how to send me money for products that didn’t even exist yet. I wish I’d kept better records to tell you exactly how many orders happened that way, but I remember printing over 40 shirts in that first run. In the deal Phil and I worked out, I would bring the designs to him on a USB stick and he’d cut them out on his vinyl plotter. 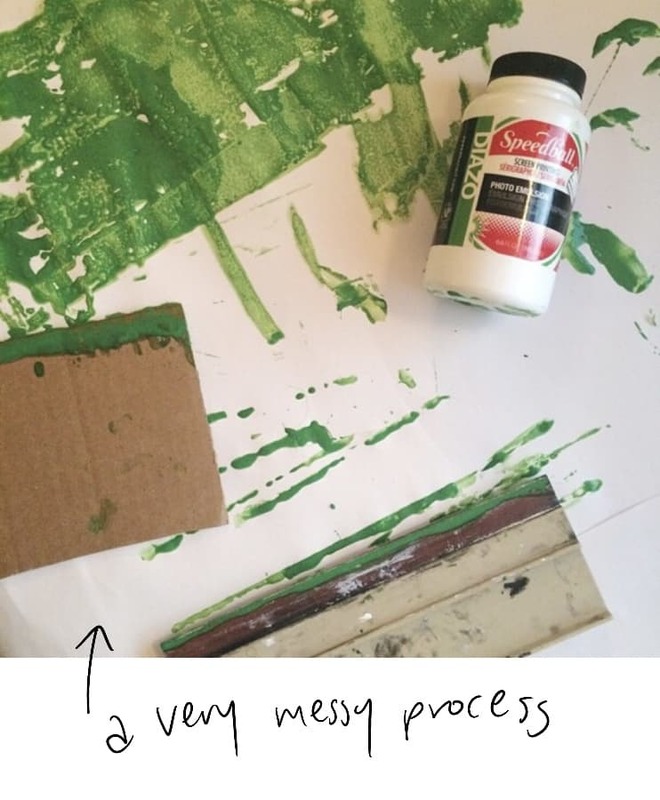 I’d then take the sheets of vinyl home to weed out (a monotonous task that involves getting rid of all the pieces surrounding the design) and bring them back to him to heat press onto t-shirts. The orders were completed and sent (along with a special extra of the logo on a pin badge) and I started getting pictures from people all over the world wearing my designs. That’s when it felt real to me. That’s when I felt like I’d found my place in the world. 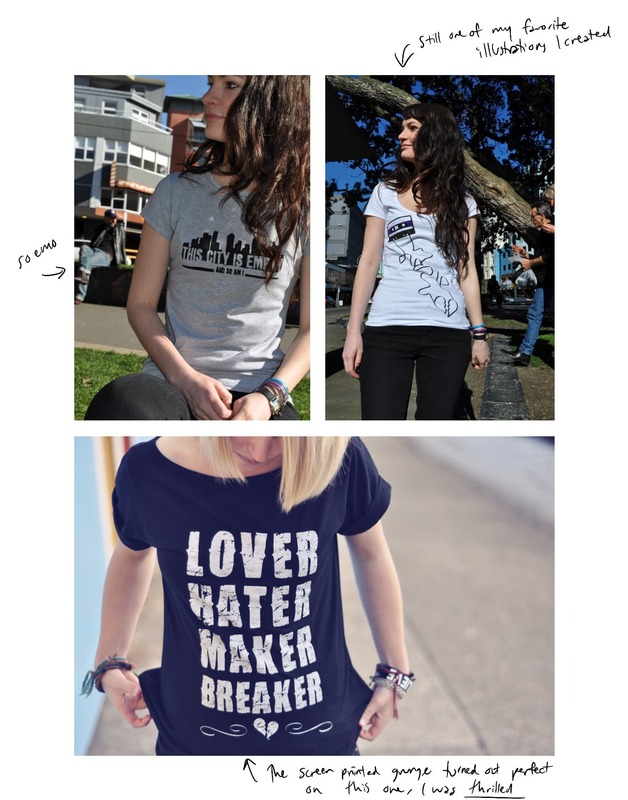 I may not have had many friends at university but now I had people in the US, Australia, England and the Philippines wearing T-shirt’s I’d designed. I loved it, and I wanted to do more. Because, as I may have mentioned already, I liked Fall Out Boy a little bit, my main inspiration for my budding clothing brand was Clandestine, a line started by the bands' bassist Pete Wentz. They’d release collections with different themes and that’s what I wanted to do too. I tried extra hard with the designs for this collection. Unlike the "design lots of lyrics and surely there will be one people like" approach I took the first time, my designs for this collection involved much more effort. All the graphics had once been a stencil I'd cut and spraypainted, then autotraced to get the texture. Copying what we’d seen from Clandestine, we did a launch with a countdown and a treasure hunt and then the designs were up for sale. Like last time, that meant people could email me with their order and send the money via PayPal. Not being based on lyrics, I worried this collection wouldn’t sell as well. But when it did, it was the biggest confidence boost I’d ever had. 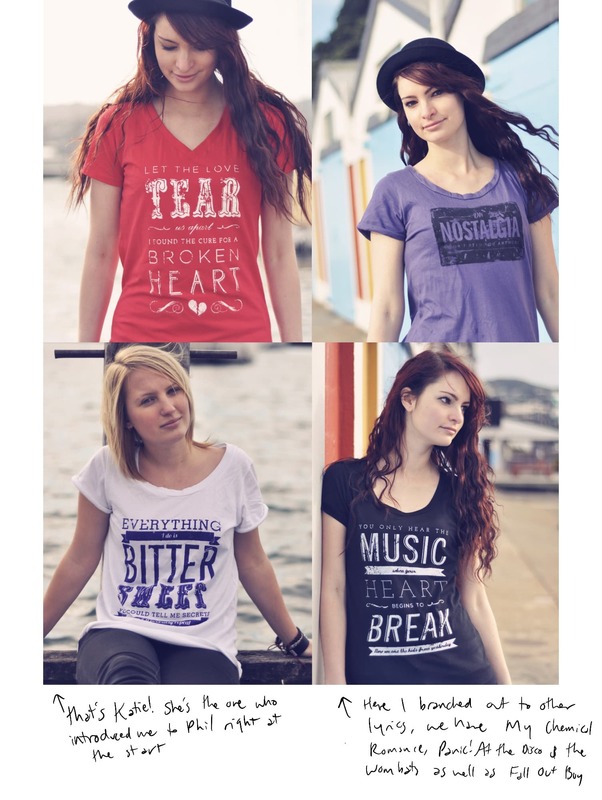 People were buying these designs because they liked Shazz’s words and my designs. Not because it was a cheaper, easier way to get band merch. 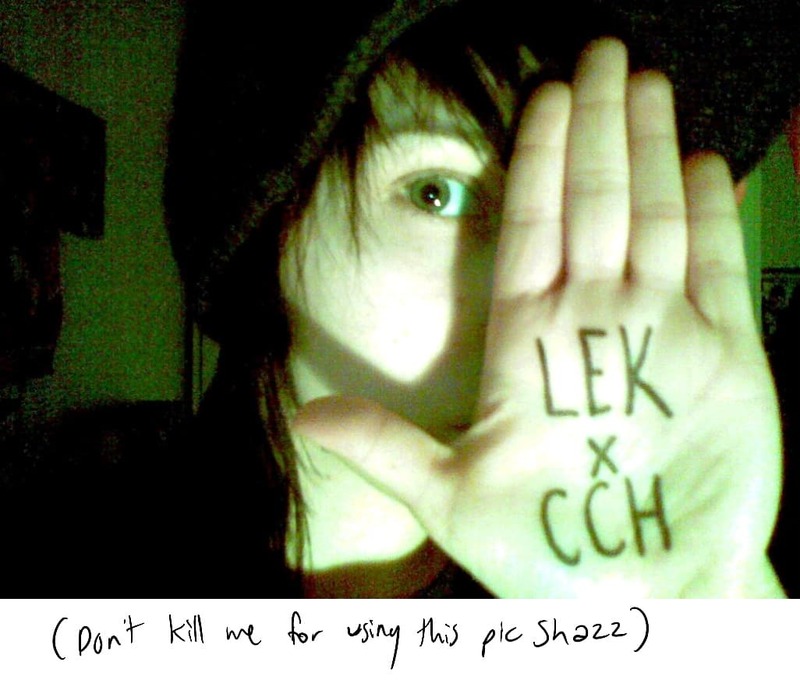 LEK was a real brand. Wanting to step even further away from my start selling lyric designs, I decided I shouldn’t use a song name for my brand name either... 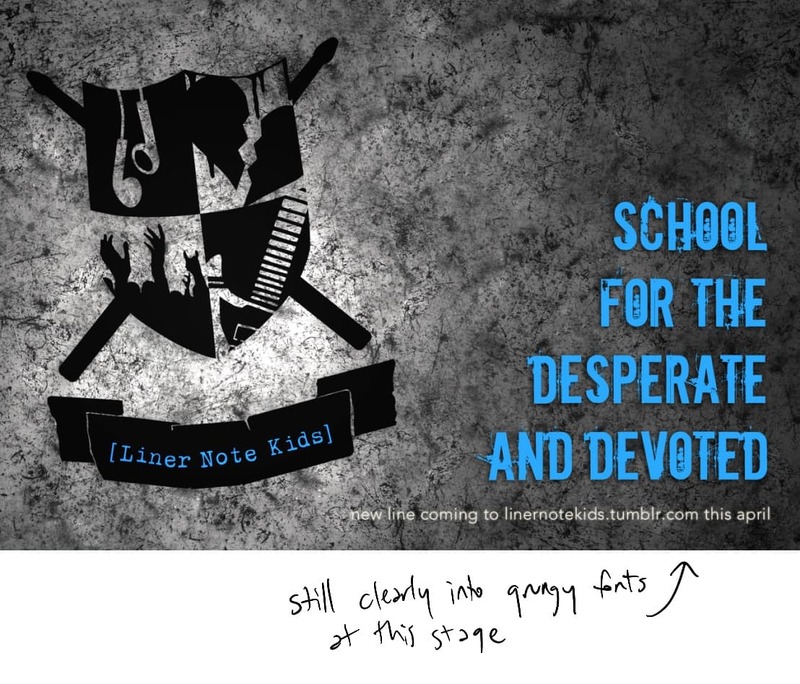 Eventually I settled on Liner Note Kids – LNK. A small shift, one letter change, but it was something more my own. In the post announcing this name change to my followers I talked about how nobody knew what Lake Effect Kid meant and that's why Liner Note Kids was better. Little did I know I'd spend the next 8 years explaining that name to everybody too, and the majority would assume it was a kids clothing line (fair enough). So, just to explain it one last time... liner notes are the sleeves inside records where a band writes their thank yous. 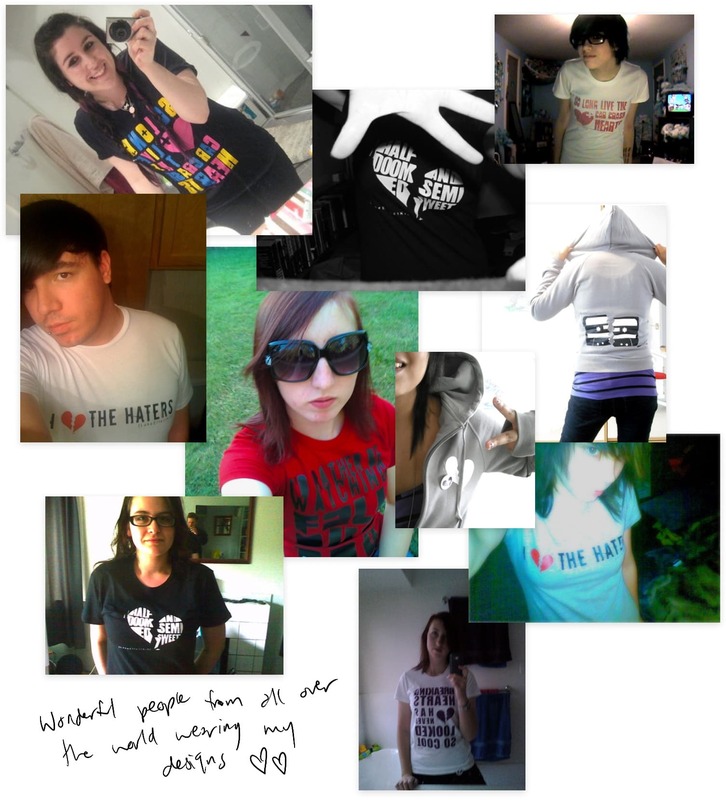 My brand was about the people who knew the band was talking about them when they said "thank you to our diehard fans". I wanted to try push harder on the theme idea for my next collection in 2010 and designed a school themed line. School for the Desperate and Devoted tried to capture all my emo kid love for music. And even included ‘school leavers hoodies’ where I’d print peoples usernames on the back. Once more it was pretty popular (by that I mean I probably sold about 50 items). Once more I couldn’t believe that these ideas I had connected with other people so well. In 2010 after wearing my own designs for a few years now I realised that vinyl printing doesn’t last very long. I wanted to offer better quality products so I set about researching what the pros do. I learned about screen printing and learned that it was scarily expensive. 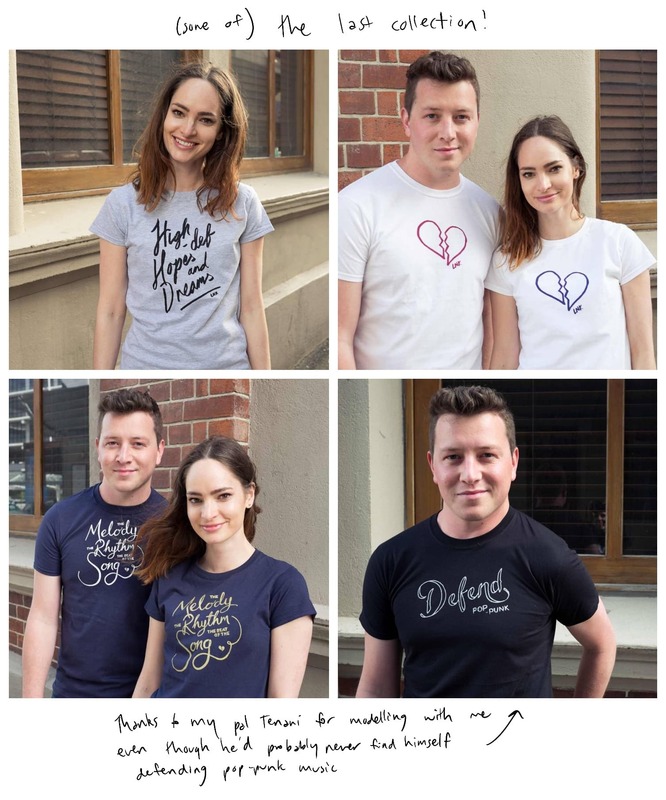 Local printers I contacted would do a minimum of 100 orders, but with my little brand I couldn’t guarantee that number of sales, and Ididn’t want to invest. So, I learned how to do it myself. I taught myself to screen print reading online tutorials. I ordered emulsion and inks from an Asian wholesale site (since Amazon wasn’t a thing in New Zealand). My dad helped me nail together frames and staple curtain fabric onto them, and my mum let me clear out the hallway cupboard to set the frames in a dark place for the emulsion to dry. They encouraged me to try again when I burst into tears after first attempts didn’t work out, and eventually I cracked it. I printed a couple of designs based on pieces from Shazz’s writing again and I was so excited about the quality. They felt professional, and I was proud. Still no ecommerce store at this stage, I sold a few of these designs through Tumblr and Phil, bless him, ordered the blank T-shirt’s for me through his wholesale account even though I was now doing the printing myself. 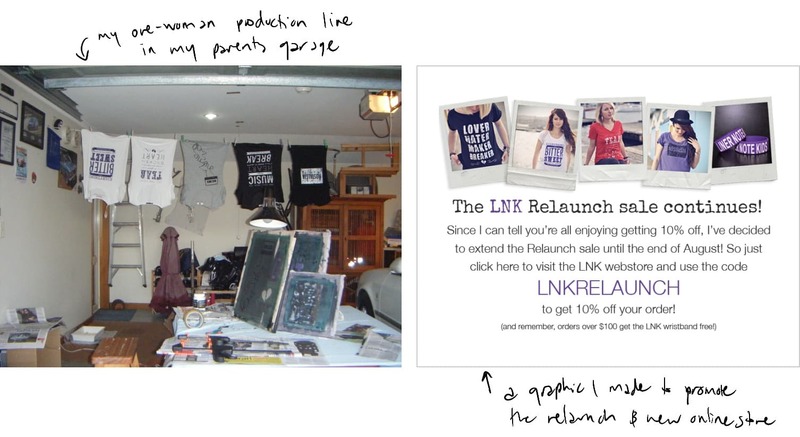 After figuring out screen-printing, the t-shirt business took a backseat for a while as I focussed on my design degree. But in 2011, in my last year of university (probably while procrastinating from my Honours project) I finally launched an ecommerce store. Aside from screen-printing materials I hadn't invested any of my own money into the business yet and I wanted to keep it that way. The store platform I picked, Store Envy, was chosen because it let me list as many items and variants as I liked without paying for a Pro account. 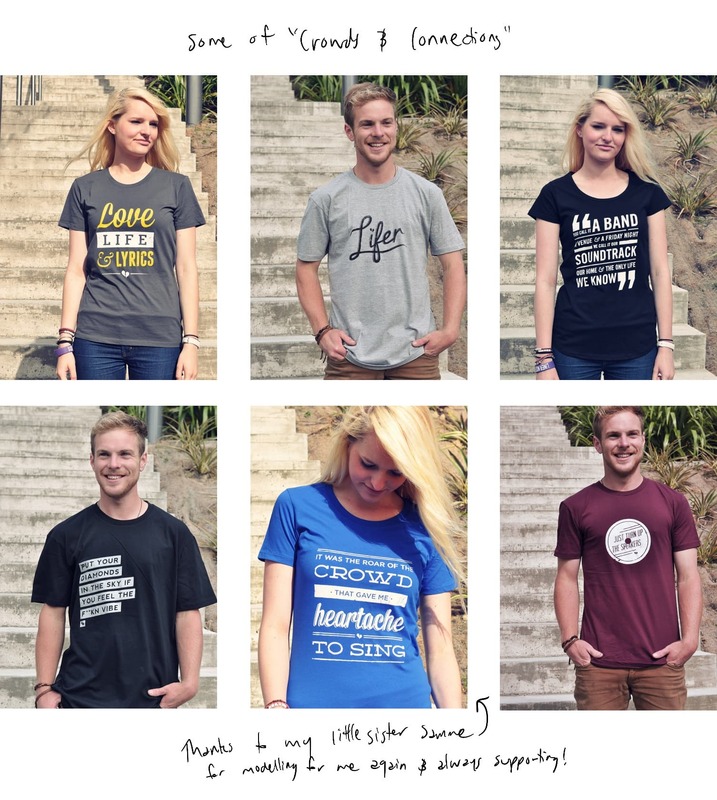 I designed some new shirts (back to lyric designs again for some reason) and called the collection LNK 2.0. 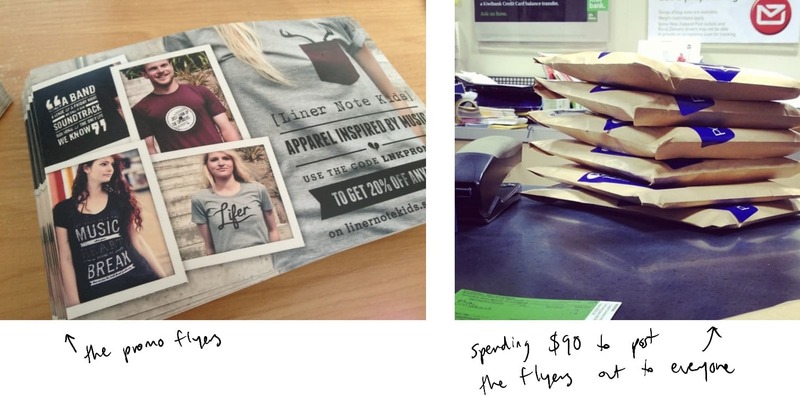 It was a new and improved version of my brand: proper webstore, proper printing, even proper product photos. The next collection, titled Crowds & Connections, followed a year later. It had one lyric design (I couldn't resist) but the rest I pulled from music-adjacent things like quotes from singers, and the antlers were a reference to the main character in a Fall Out Boy music video. 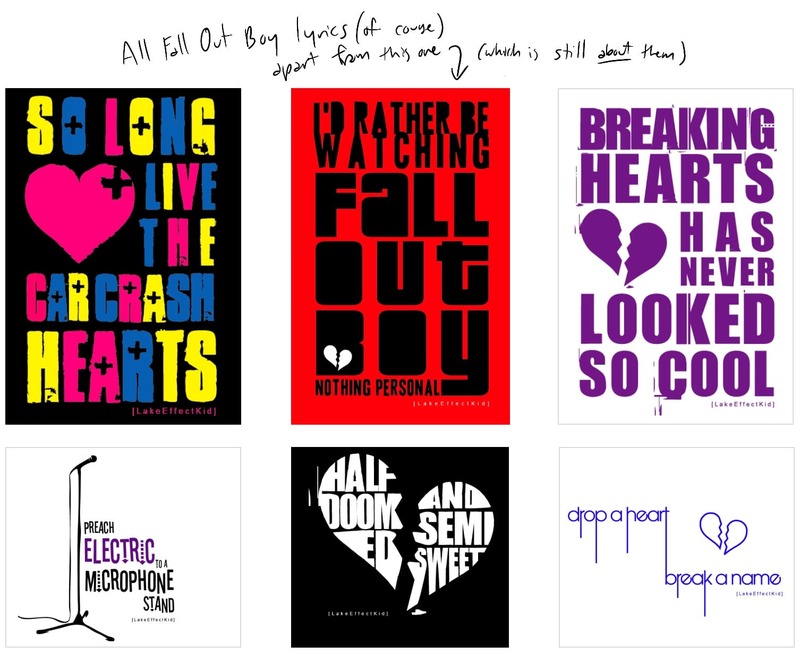 For one design in this collection I wanted to use a quote from a LiveJournal post by Christopher Gutierrez; an author and friend of Fall Out Boy. I reached out to him to ask for permission and we struck a deal that he'd let me use his words on my t-shirt and I'd let him use the design to sell posters. He reached out to me again a couple months later to get me to design a layout for another quote to sell. This was the first time my side business had directly led to freelance work, and it made me wonder if it could be my path to designing real merch for bands one day. Perhaps it was because my original Tumblr audience had moved on to other places on the internet (the website certainly had changed a lot by 2012), or perhaps it was because I was giving more focus to my YouTube audience, but my screen-printed collections just didn't have the same hype around them that the earlier releases did. I spent 2013 trying to make more sales. I created a promotion where I gave kids a discount code to share, and if people bought using their code they'd get free shirts. I even designed and printed flyers for them to hand out. But it didn't help much. I've often wondered, if I had bothered to learn more about business and email marketing and how to do it well would I have ended up in a different place? As it was, I was just copying tactics I'd seen other clothing brands use and going with my gut. It had served me well up until this point, but now it appeared I was a little out of my depth. Instead of stopping to learn more about business, I went back to doing the part I was best at: designing t-shirts. In 2014 I was planning on moving to London, and I knew that once I was there I’d find it really hard to create a new collection without my dad to make frames for me and the space that my Wellington flat allowed. So I set about designing one more line. I didn’t know at the time that it would be my last. When I moved to London, I had my parents ship my screens over to me and I continued to print and ship orders when they came in. A year went by and I started thinking that perhaps I should be designing a new collection, but my heart wasn’t in it. The last one never had the initial burst of sales like my previous launches did. Sales had slowly dripped in, but I didn't realise how much the excitement from my early customers was fuelling my own passion for the business. Without it, I didn't know what to do. Liner Note Kids didn’t end with a bang. It died slowly over four years of competing priorities and a waning interest from both me and the business' original fans. I’d found another side project to fall in love with: YouTube. And I could see a future with it. 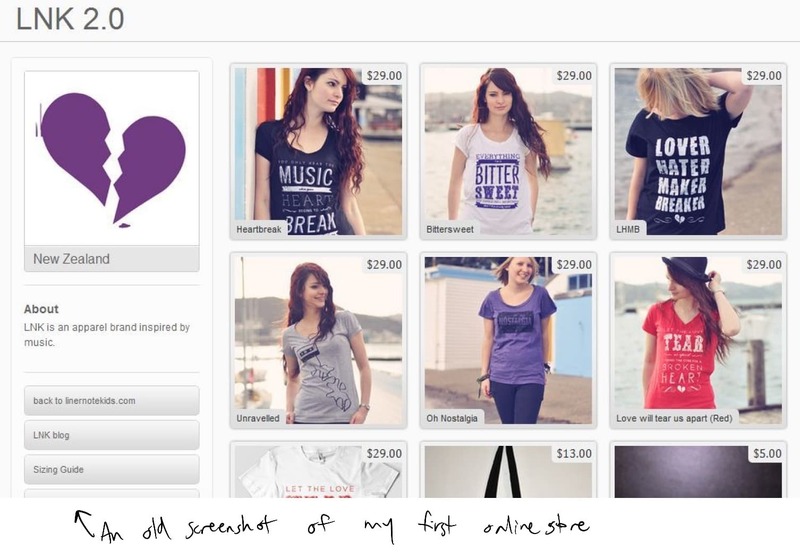 It’s hard to run a ecommerce brand as a side project. It’s a lot of work to keep driving traffic to your store, to keep getting new people interested in your brand. And you need to keep releasing new stuff, which means a lot of time needs to be spent designing and developing new products. I knew that’s what I would have to do to make it a success, but it was too much for me to commit to. While in those early days I was ecstatic to receive an order, I started to see each new (admittedly sporadic) sale as a burden. My prices were so low that they just barely covered the cost of materials and shipping, let alone my time spent printing and doing all the admin. But I wasn’t confident enough in my product to charge more. And I think some part of me felt like keeping prices low meant I could be forgiven for keeping my effort low too. It took a long time for me to come to terms with the fact that Liner Note Kids and I were over. Giving up on it felt like a betrayal to the 19 year old who saw a future that involved maybe one day having her own retail store and designing merch for all her favorite bands. At 29 I knew that wasn’t my dream anymore, but I remembered clearly how much it meant to me once. How many tough times that thread of hope got me through. The years of loneliness and struggles at university where the business and its followers gave me the confidence to keep going. In my real life I was a nobody, but the brand made me somebody online. 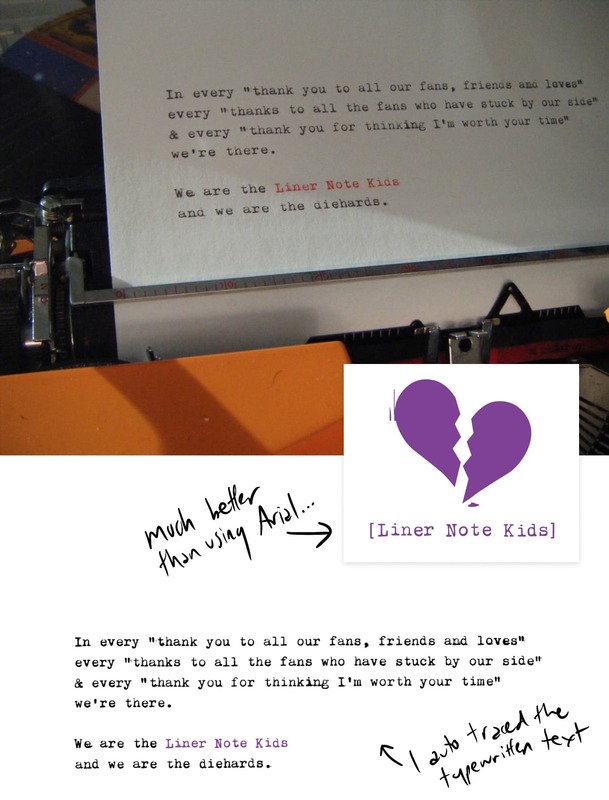 Liner Note Kids ended because I didn’t need it anymore. I’d grown confident in my skills and in who I am as a person. My career was thriving, and I’d fallen in love with teaching designers to get better at what they do. The future I imagined no longer involved a retail store full of clothes I’d designed, but rather walking into a bookstore to see my name on the cover of a hardback. And so, with a heavy heart, at the end of 2018 I closed my store. In Marie Kondo fashion I said a silent thank you to the brand that had gotten me through the turmoil of my early 20s and helped me become the person I wanted to be. But it was time to move on. Time to clear brain space for bigger and better things that current-me feels passionate about. I know that my past self would be proud. I also know that she wouldn’t believe where Liner Note Kids took me. That business was my training on how to hustle. It taught me that I can learn to do anything I want. It taught me time management and discipline, and most importantly it taught me how important passion is. Passion is what kickstarted my first business. Passion is why strangers on the internet trusted me to deliver their products (it certainly wasn’t the Tumblr text posts...). And a lack of passion is ultimately why it died. For a long time I thought of my first business as a failure. But really it was just a chapter in my life that needed to end. My dreams changed, and so did I. So I’m making a promise to myself to always be working towards something that makes my heart sing as loudly as those lyric designs did ten years ago. RIP LNK. Thank you for everything. A breakdown of my different income sources for the 2017/18 tax year.